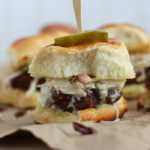 These tasty meatball sliders have ground bacon mixed right in! Topped with creamy coleslaw and served on sweet Hawaiian rolls, it's a match made in heaven. Form beef mixture into 1 ½ inch balls, roughly the size of a golf ball. Spread them out evenly on a greased cooking sheet or rack. Spread barbecue sauce over the top of each meatball. Bake for 15 minutes or the internal temperature reaches 165 degrees F.
Combine the mayonnaise, white sugar, lemon juice, vinegar, ground black pepper and salt in a small mixing bowl. Pour the dressing over the coleslaw and stir until the cole slaw is thoroughly coated with the dressing. Slice the buns in half. Butter the insides of each roll. Toast for about five minutes until the bread is toasted. Keep a close eye on the rolls so they don’t burn. Tear the rolls apart. Place one meatball on the bottom of each roll. Top with cole slaw. Place the top of a bun on each slider.